Avian flight is impressive because aerodynamic performance increases in lower Reynolds ranges, whereas the performance of fixed wing aircraft declines. In order to achieve biological inspired flapping, actuation in multiple degrees of freedom is required and power density requirements must be satisfied; given the mass of high output actuators, weight is a key limitation as it must be offset for flight. In light of this, only recently, with developments in motor technology, has independent wing control been achieved with consumer available components. Due to power demands, motor bandwidth is used largely to sustain flight, limiting the effect of the wing independence. An interesting paradigm is one where the aerodynamic flight advantages of propeller-driven flight are utilized in addition to those of flapping wings to allow hybrid vehicles that can occupy unique operational bandwidth. 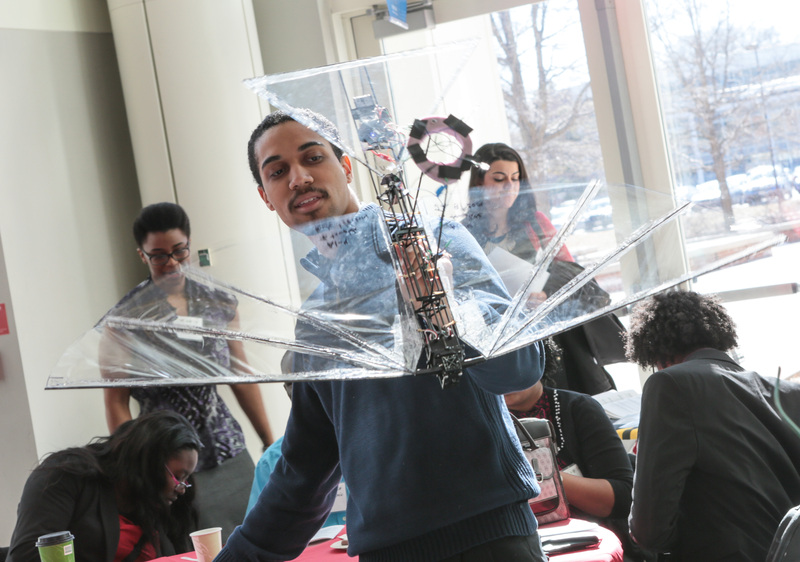 In this work propeller, a modification of the independent wing Robo Raven flapping air vehicle developed at the University of Maryland College Park, is presented. Having successfully flown with propeller assistance and having demonstrated improved force generation for aerodynamic performance over flapping alone, this modified Robo Raven will constitute the next major iteration of the vehicle as Robo Raven 5. Transitional Behaviors of Flapping Wing Robots. The goal of this work is address a significant scientific challenge preventing bird-inspired, flapping wing, robots from doing more than just flying. Specifically, their ability to transition from flying to walking, taking off, landing, and perching. These transition behaviors are required for bird-inspired robots to do simple maneuvers essential for autonomous operation. This is important when one considers the task of searching for survivors and inspecting the hundreds of thousands of damaged building—structures too dangerous for first responders. Generating transitionally behaviors will remove the need for a human operator to be in field for deployment, providing additional functionality to flapping wing robots that will make them competitive with small aircraft such as quadrotors and planes. I attended the University of Maryland, Baltimore County as a Meyerhoff Scholar studying Mechanical Engineering. I attained my BS in Mechanical Engineering in 2013. I am an alumnus of Takoma Academy in Takoma Park, Maryland where I return on occasion to lend my time and experiences. My academic interests are robotics topics. I hope to develop a useful flapping wing flight platform and leverage my experiences with robotics at the University of Maryland, College Park to enhance science, technology, engineering and math STEM education. My goal is to address a significant scientific challenge preventing bird-inspired robots from doing more than just flying. Specifically, their ability to transition from flying to walking, taking off, landing, and perching. These transition behaviors are required for bird-inspired robots to do simple maneuvers essential for autonomous operation. This is important when one considers the task of searching for survivors and inspecting the hundreds of thousands of damaged building—structures too dangerous for first responders. Realizing my goal will enable researchers to make significant advances in aerial robots, enhance their usefulness and inspire the next generation by empowering STEM education such that the next generation will have tools that were not available for past disasters like the Japan Tsunami, Hurricane Sandy or 9/11.